We are pleased to announce that Event Espresso 4 is now fully integrated with the Stripe payment gateway. Stripe is a quick and secure way to accept credit card and debit card payments online. With the Event Espresso Stripe integration, you can create exactly the payment experience you want in your Event Espresso powered website, and Stripe handles everything from security to transfers to your bank account. You can get started immediately. Thousands of businesses and organizations are using Stripe today: Fortune 500 companies, rapidly-growing startups, side projects, nonprofits, and everything in between. Check out the gallery for a broad sampling. 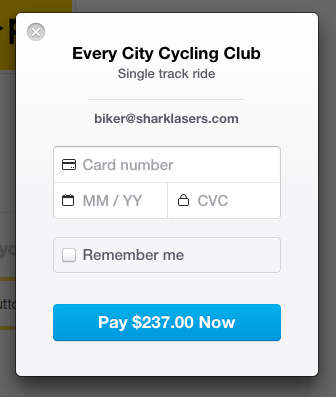 Purchase the Stripe Payment Gateway for Event Espresso 4. Your customers will see exactly what you want them to see—and they’ll never need to leave your Event Espresso powered website. By using any of Stripe’s client libraries, such as Stripe.js for the web or the mobile APIs, you’re automatically compliant with the strictest PCI requirements. No sensitive data hits your servers, saving you hours of security headaches. Funds are added to your bank account on a seven-day rolling basis. A two-day transfer may be possible after your first transfer. Visit Stripe’s documentation for more information. Super excited about this… I have the Everything License, but can’t figure out how to download the plugin without paying for it? Assistance please! Any chance to configure advanced payment options? We would like to disable AMEX. We don’t control the card options in Event Espresso, can you disable them in Stripe? This payment method does not support the currency set on your site (EUR) and so will not appear as a payment option to registrants. Please activate a different payment method or change your site’s country and associated currency. Can you post to the forums so we can investigate that further for you? Stoked that you added the Stripe functionality! Thanks from NeONBRAND!